Have you ever been confused about a bunch of videos and movies stored on your hard disks which have occupied too much capacity on your computer? If you are falling to the category, then you may choose to buy a proper portable hard disk which can allow you to put your videos on it so as to release more space on your computer. But for me, I think another efficient way is to burn these videos and movies to a blank DVD disc. In order to burn the videos to a DVD disc, mostly, you have to prepare some additional burning software to complete the burning process. Luckily, if you are running on the Windows 7 operating system, things may turn to be easier because Windows 7 contains the tools to burn your video to DVD. Today, we will provide you more guidance on the recommendation about the software to burn DVD in Windows 7 asides from its internal tool. Just take some time to obtain the useful information. 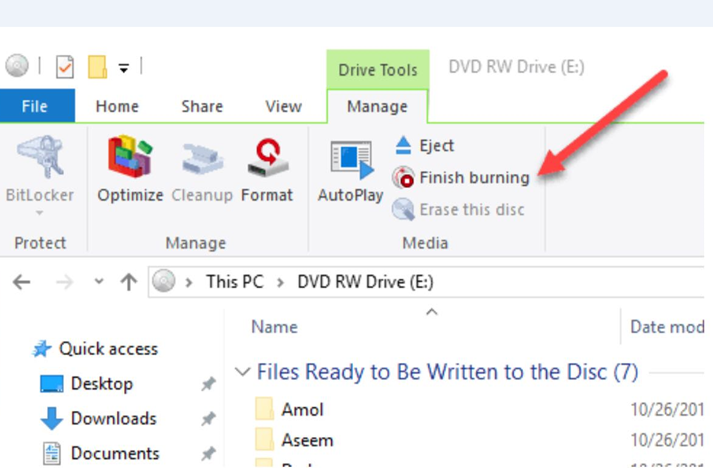 Part 1: How to Burn DVD in Windows 7 without Software? Part 3: How to burn DVD in windows 7 with Leawo DVD Creator? If you are totally a newer to the Windows 7, and by the way, you still have the demands to burn your videos to DVD, then how to burn DVD in Windows 7 without software? Absolutely, Windows 7 contains an internal burning tool which can help you to burn DVD with several steps. Now, it is the time for you to take a look at the following steps for your future instruction. Step 1. Prepare a blank DVD disc and insert it to the disc drive on your Windows 7. Step 2. 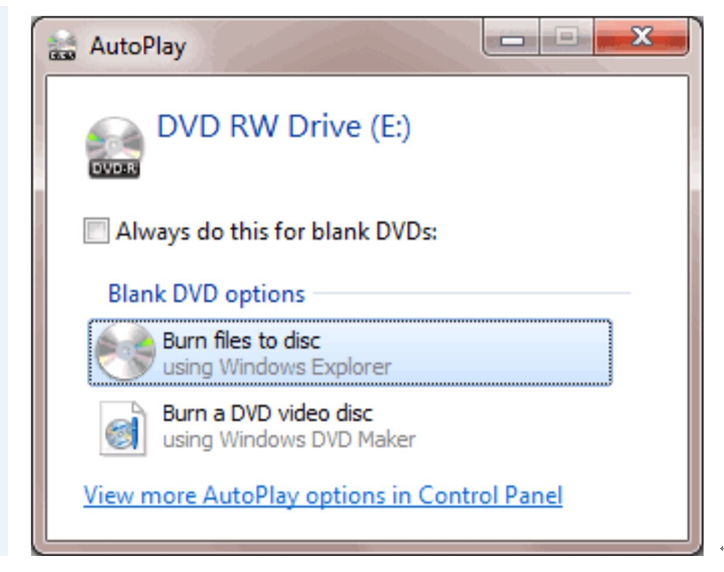 Once you inserted a blank DVD disc into the drive, then a dialog will automatically appear on your screen as an AutoPlay window. If the window doesn’t appear automatically, then you can go to Computers to find the CD/DVD drive icon and double-click it. 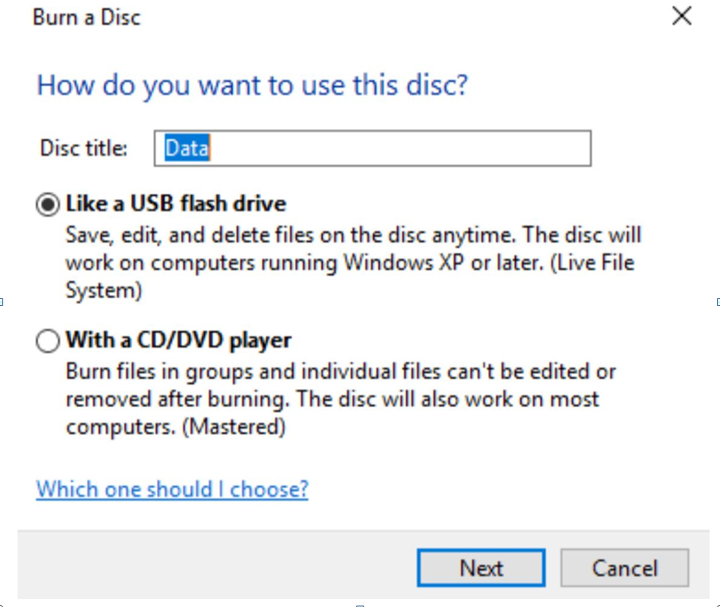 Then, choose the option of Burn files to disc to move on. Step 3. Then you will be reminded to give a name to the DVD disc you are going to burn. Input a name in the Disc title, and choose whether you would like it to act like a USB flash drive or with a CD/DVD player. For the first option, you can be only allowed to play the disc on Windows XP or higher operating system. While for the second option, you are available to play the DVD discs in both Windows and DVD players. So you had better click With a CD/DVD player. Then click “Next”. Step 4.Add your videos or files that you would like to burn to DVD to the disc folder. You can find the folder by clicking Computer and CD/DVD Drive. 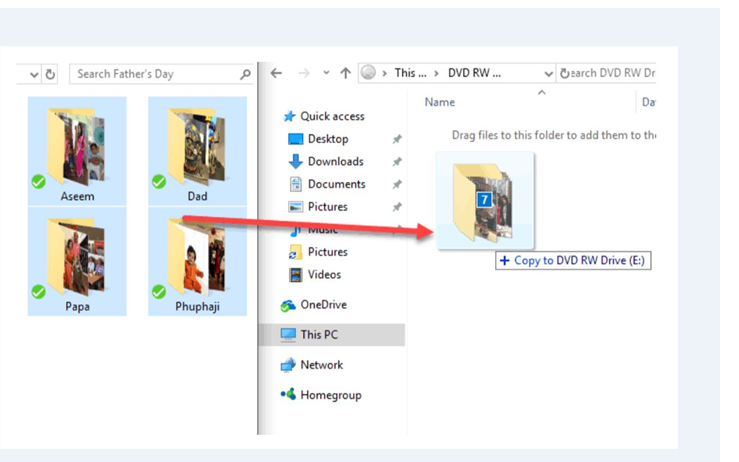 For your convenience, you can open another window at the same time, so you can directly drag the videos to the DVD drive folder. Step 5.Once you have added all the files you would like to burn, then go to “Manage” menu under Drive Tools options where you can find the Finish burning option. Click it and you will see a Burn to disc option. Step 6.Click Burn to disc option to enter the final burning setting panel, you can set the Disc title and Recording speed. Step 7.Wait in patience and it will take some time to finish the burning process. Once it is finished, you can see a message that “You have successfully burned your files to the disc”. 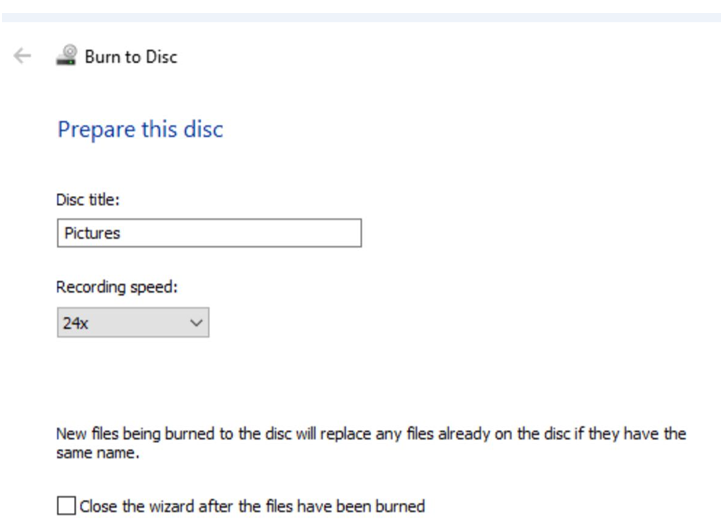 By the way, there is an option that allows you to burn these files to another disc. If you agree, then take a tick in the box. That’s it. By following the above steps, you can do this without any additional software to burn DVD in Windows 7. By knowing the method on how to burn DVD in Windows 7 without software, you can still burn your preferred files to DVD with several steps. However, for those ones who have no idea about the detailed instructions, is it possible for them to burn DVD in Windows 7? It is entirely possible to achieve the goal once you have prepared a piece of powerful software to burn DVD in Windows 7. Next I will introduce some free software to burn DVD movies for Windows 7 and some charged software as well. You can find a lot free software to burn DVD movies for Windows 7 over the Internet. I will list the top 3 based on the comprehensive features. 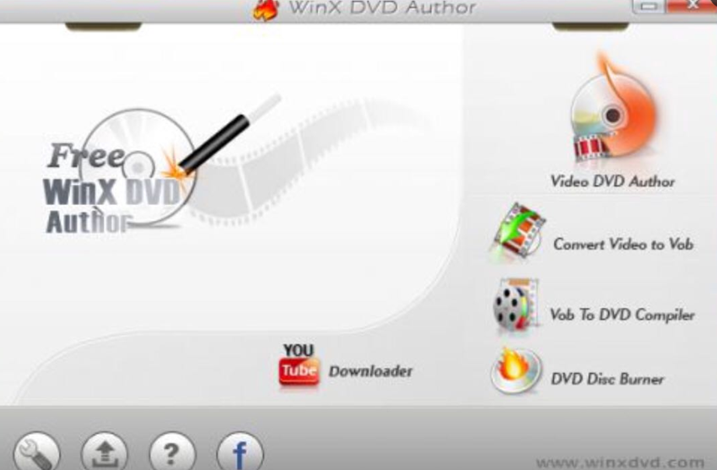 The first free software to burn DVD movies for Windows 7 I will introduce is Windows X DVD Author. 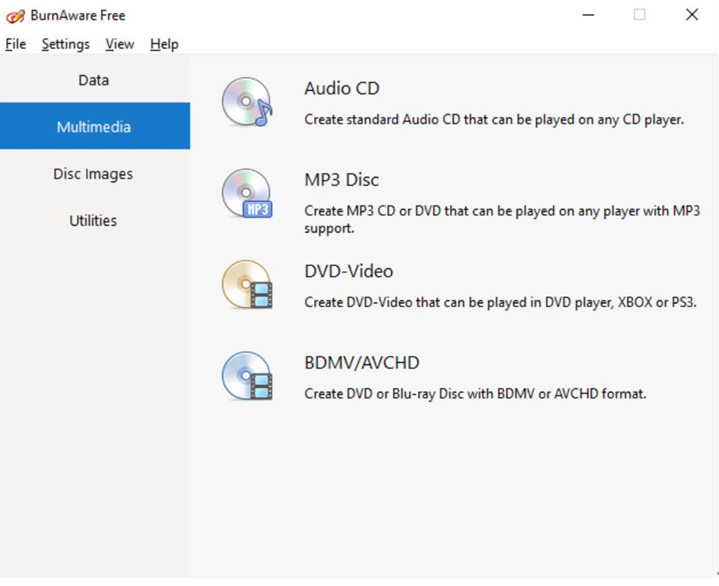 As one of the best free burning programs, Windows X DVD Author can allow you to burn a variety of video files to DVD, including MP4, AVI, MOV, WMV, VOB and so on. It supports different disc types, such as DVD +/- R, DVD +/- RW, DVD DL +/- RW which could be compatible with Windows 7, 8, and 10. What’s worth mentioning is that this DVD burning program includes a tool to download video from YouTube which enables you to free convert YouTube videos to DVD with simple steps. Last of all, it is totally free and reliable burning program. 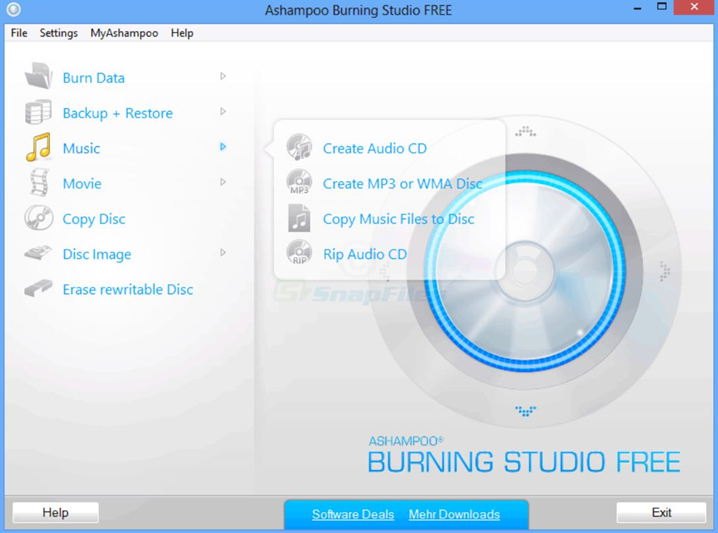 The second popular and free software to burn DVD movies for Windows 7 is Ashampoo Burning Studio Free. Designed by a German company Ashampoo, this burning program can guide you to burn videos to DVD discs with several simple steps. It can’t only rip movies to DVD discs, but also can burn audio CDs and data discs as well. 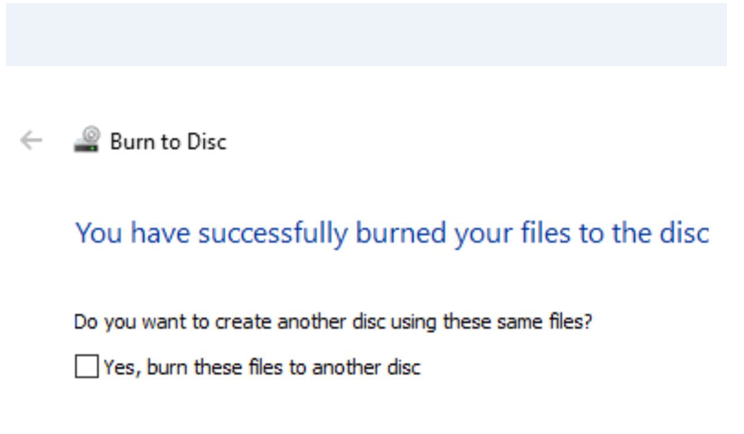 Furthermore, if you have the need to burn Blu-ray discs, this burning program can still meet your demands. One of the most attractive points for this program may lie in the simple interface. You can easily handle with it even though you are not an IT nerd. But one more thing you should focus is that you need to register with your email address to obtain a license key so as to smoothly take use of. Even though you can find a lot of free software to burn DVD movies for Window 7, there still exist some limitations. For your comprehensive usages, you can turn to some more professional burning programs which charges at a reasonable price. The first I will put in the first place is Leawo DVD Creator. Leawo DVD Creator egarded as one of the most powerful DVD burning programs in recent years, Leawo DVD Creator can help you to burn your reluctant files to a DVD disc with customized features retained. 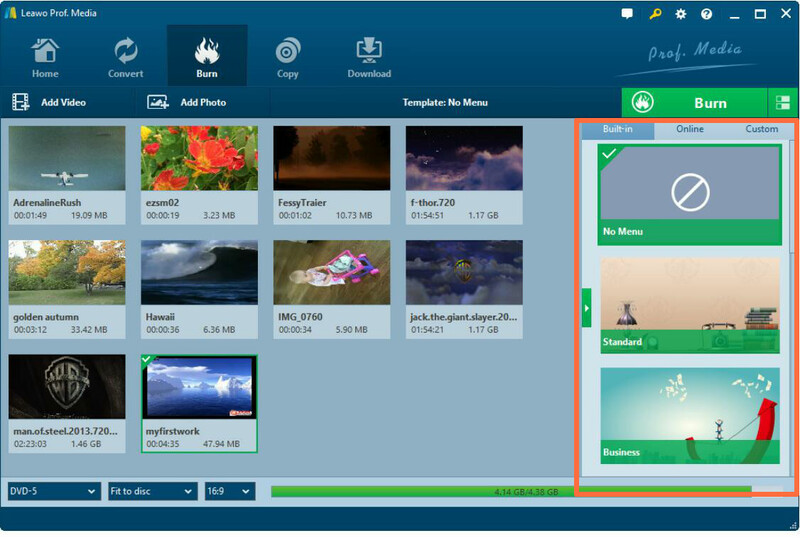 With Leawo DVD Creator, you can burn more than 180 formats videos in formats like AVI, MKV, MP4, WMV, Xvid, MOV, and FLV to DVD-9 and DVD-5 discs. Also, you can change the disc menu templates and the items on the disc menu with fast speed and high quality so as to obtain a customized DVD disc. Furthermore, you can edit the video by yourself to make it your own style. Asides from DVD burning, it can allow you to convert photos into slideshows and burn to DVD. Another popular burning program for Windows 7 is Nero 9 which has been regarded as the shareware optical burning program in the past years. Nero 9 can be applied in various operating platforms, whose prices vary. It is comprehensive in burning all kinds of digital files, including audio, video, photos and images. At the same time, you have to pay for about $80 to enjoy its professional features after all. But many people reflect that its burning speed is not as fast as imagined. Another quick but a little pricy DVD burning program should be Express Burn. You can use it to seamlessly burn video to DVD disc with several steps. It can allow you to convert various formats to DVD disc, also it supports many DVD types, including DVD-R, DVD-RW, BD-RE, BD-R and so on. For most people, the converting speed is the main key for this burning program. But someone believes that its price is a little higher than other program. It doesn’t have preview function and doesn’t allow re-arranging tracks either. Just as mentioned above, Leawo DVD Creator is comprehensive in burning functions and customized features, then how to burn DVD in Windows 7? Please refer to the following steps. Step 3. Open the program and import the video files to the main panel of the program by clicking “Add Video”. Step 4. Set the disc menu templates. If you want to create a menu for DVD, ou can choose from the templates library from the right-hand column or you can DIY your own disc menu. That’s it! With such a burning program, you can freely burn DVD in Windows 7 with several simple steps. If you have are interested, just take it a try and you will love it.